The Angulo siblings have spent their whole life in New York, but they never left their apartment for almost 14 years. The only glimpse to the world beyond their walls was through cinema, as the children became huge film fans in the confides of their parent’s apartment. Filmmaker Crystal Moselle met the Angulo brothers out around town as they were walking around, together in a pack, which lends itself to the name of the documentary about the film-loving Angulo’s, The Wolfpack. Moselle spotted an unusual group of kids on First Avenue looking bewildered and out of place, all dressed in sunglasses like the characters from their favourite film, Reservoir Dogs. Curious as to what these seemingly lost group of children were up to, Moselle befriended them and thought they would make an interesting documentary. Their father Oscar, a Peruvian immigrant, is a devout Hare Krishna follower who was incredibly paranoid of the outside world in New York, worried that the city would corrupt his children. So he opted to keep the front door locked at all times, never allowing his children to experience life beyond those walls. Their mother, Susanne from the mid-west of the US, was the only education that the children received. It took a while for Moselle to gain the Angulo’s parents trust, but eventually she was allowed within their world. Expecting these children to be damaged somewhat by being trapped in the same building for so long just watching classic films, it was a pleasant surprise to Moselle that the gang came across as the most gentle, insightful, curious people she had ever met. The seven children, Bhagavan, twins Govinda and Narayana, Mukunda, Krisna, Jagadesh, and their younger sister Visnu are huge film fans and have watched over 5000 movies. The have always enjoyed re-enacting favourite scenes from films with whatever props they could find around the house. Moselle found it interesting in how these films shaped the Angulo children’s views of the world outside. The Dark Knight left a particularly large impact on Govinda where he felt that he could believe that there is another world, and that it made him believe it was possible to escape this world. Which in fact is what happened. An escape which happened when one of the brothers managed to make his way out of the apartment, and this act of escapism paved the way for all the other siblings to escape too. Now, everyone but Visnu, the eldest sister who has learning difficulties and stays at home. For the other brothers, they are finally moving on in their life away from the walls of their parent’s apartment. Bhagavan is learning how to dance at a hip-hop group, Govinda has moved out of the apartment and is now working as an assistant cameraman and aspires to be a director of photography. Younger brother Narayana works for an anti-fracking organisation and has a strong interest in the environment. The first brother to leave the apartment though was Mukunda who is an aspriring director and writer. The only members of the family still living at home with the parents are Krisna and Jagadesh. 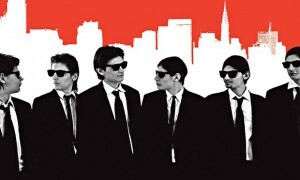 The Wolfpack premiered at Sundance Film Festival last month and claimed the Grand Jury Prize for Best US Documentary and will be released soon.